Okay GeekMom friends, a show of hands…how many of you watched Felix Baumgartner’s space jump live? Further, how many of you watched it with your children? Like with the Mars Curiosity landing in August, my family didn’t think anything about letting our kids join us Sunday morning in tuning into Discovery Channel to watch the ascent of the Red Bull Stratos balloon, listen to Baumgartner and chief communicator (and previous free fall record-holder) USAF Colonel (Retired) Joe Kittinger run through checklists, and then watch the live feed of Baumgartner’s free fall. Geeky Fact: After Colonel Kittinger broke his multiple records from his own free falls from space, he went on to serve as a pilot in the Vietnam War. He was shot down over North Vietnam and had to spend 11 months as a POW in the infamous “Hanoi Hilton” prison. Did it cross my mind that my children might actually see a man go SPLAT! across the New Mexico desert? Did it cross my mind that my children might see Baumgartner’s limbs get ripped off? Did it cross my mind that my children might see a footage of Baumgartner’s family going bezerk on live TV if he didn’t make it? Yes, all those things crossed my mind. But for some reason I didn’t find that a reason to not let my children watch science in action. By the time we turned on the Discovery Channel a little more than an hour into the ascent, the balloon was already at about 70,000 feet. My 10-year-old son — our numbers geekling — was absolutely in awe of the statistics being shown. He listened intently to the discussions of how the balloon/capsule/parachute system would work, the records that might be broken, and the temperatures and atmospheric pressures that were being measured during the ascent. Please don’t think we were simply glued to the set watching a balloon rise. I’m sorry, it wasn’t quite that exciting. I found the time to write up a book review for my personal blog, and my kids enjoyed a game or two of Farkle. Now join me on my emotional roller coaster as we watched Baumgartner’s achievement from the comfort of our living room. HIGH: When Kittinger began to run the checklists with Baumgartner, we all paid attention. We could hear the valves opening up to depressurize the capsule…and we could watch on the TV screen the interior pressure reduce so low, to match the exterior pressure of about 5-10 millibars. Geeky Fact: Did you know the average atmospheric pressure on Mars is about 6 millibars? HIGH: We all watched intently…waiting…waiting…waiting…for that capsule door to open and for Baumgartner to step out. During that time, we pondered many things. I publicized some of my ponderings on Twitter, and would like to thank @benhaminjuhlin for the reply. It turns out I could have just done a little Internet-sleuthing to answer most of our questions. HIGH…or was it LOW? : He leapt off that platform! I cried out in horror as he did…and I apparently held my breath as the statistics started. It was all so fast — the camera mounted to the capsule could only capture him for a split second before disappearing into a tiny dot over the continental US landscape. LOW: Then the footage switched over to an infrared camera filming what, at first, was that tiny dot. I was so impressed with the ability for that camera to center on Baumgartner himself, he was falling so quickly. We could hear the audio feed of his breathing. We could see a meter on the screen measuring his available oxygen, and there was an attempt to measure his fall velocity. As the tiny dot grew a little larger, it was clear that he wasn’t in control. I didn’t think he sounded that uncontrolled based on the breathing, but we could see limbs spinning and flailing and I felt a sense of panic! LOW: I was frightened for him! I was frightened for his mother and girlfriend who were constantly being shown on camera…so they could share their fright and delight with the rest of the world. Seeing the footage of his mother’s reactions was very moving to me also. And it turns out I’m not the only one who felt the heart strings pull when seeing her incredible emotions. HIGH HIGH HIGH: The kids were so excited about this — we all cheered when the parachute opened, and cheered again when he hit the ground. My oldest was discussing what it must have felt like to travel at 700 mph (which was the fastest we speed we saw on the screen before the atmosphere slowed him down). My youngest — my more compassionate son — was very glad he made it down okay. Geeky Fact: This presentation by Red Bull Stratos chief meteorologist Don Day is about the very precise weather conditions required for this mission to have been successful. It had been canceled two times previous to the 14 October success. Did you miss the jump? 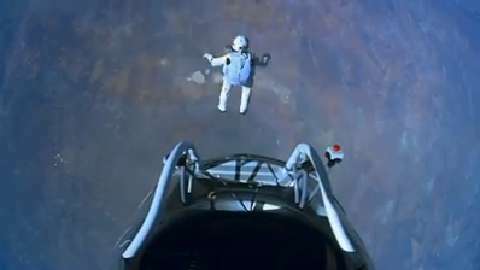 Here is a highlights video by Red Bull Stratos — I’m sure it was no accident that Baumgartner leaps at exactly 1:00 into this video!